St. Mary’s University celebrated the 300th anniversary of San Antonio’s founding in royal style. 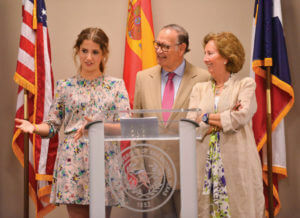 The St. Mary’s community welcomed Spanish nobility — the Duque de Béjar, Pedro Roca de Togores; Duquesa Marta Garcia Perez; their daughter, Maria Sandra Roca de Togores; and their granddaughter, Cayetana Roca de Togores — to campus in May to illuminate their ancestors’ role in the city’s founding. In her lecture in the University Center, the duque’s granddaughter Cayetana discussed the family’s role in financing the expedition that would lead to the founding of the Mission San Antonio de Valero in 1718 and the subsequent founding of the first civilian municipality in Texas — San Antonio de Béjar, named for her family. After the settlement’s founding, though, the connection to Béjar, Spain, and the royal family, “sadly faded away,” she said. It wasn’t until 1974 that the connection was firmly reestablished when a ragtag band of Texans arrived at the current duque’s family home in Seville, Spain. “Then all the Texan people came to meet my great-grandfather, who was ill at the time, and they named him honorary mayor. Then, a couple of years later, they named my grandfather the honorary mayor,” Cayetana said. When the current duque’s son, Pedro A. Roca de Togores, looked to attend university in the United States, the family set their eyes on San Antonio and selected St. Mary’s University. The current duque made his first trip to San Antonio when his son graduated in 1992. San Antonio is very much “like my second home,” added Duque Pedro Roca de Togores.